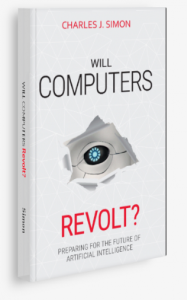 New Book: Will Computers Revolt? ANNAPOLIS, MD, USA, March 11, 2019 /EINPresswire.com/ -- “Computer science is one of the hardest and most intellectually challenging subjects to take. The specialization within it means entire areas are inaccessible to even talented computer scientists. Here are 20 suggestions of books you should read...to have a more broad understanding of the subject,” says Taegan Lion at fupping.com1. This list includes Will Computers Revolt? A new book detailing the future of artificial intelligence (AI) in an easy-to-read format of what and how humanity should prepare for the impending revolution. “All of us—not only scientists, industrialists, and generals—should ask ourselves what we can do now to improve the chances of reaping the benefits of future AI and avoiding the risks.” —Stephen Hawking. Kirkus Reviews Magazine selected Will Computers Revolt? to be featured in Kirkus for reviews of notable books. An excerpt, “A bold and rigorous contribution to the literature on an increasingly important scientific subject.” —Kirkus Reviews. Boston Commons says...“There is a lot of excitement about artificial intelligence” and the article is adapted from Will Computers Revolt? Want to read more reviews2 of this book? Or BUY it at Amazon3 or other retailers worldwide. Will Computers Revolt? is written by nationally recognized computer software/hardware expert and AI pioneer, Charles Simon. He is noted for two generations of CAD, the creation of two Artificial Intelligence Systems, neuroscience, along with software for EEGs. Also, Mr. Simon has co-founded several pioneering technology companies. Previous publications include a book on Computer Aided Design, numerous technical articles, book contributions with write-ups in Newsweek and other media. Mr. Simon is a member of IEEE, TripleNine, Intertel, Mensa, AAAI and AAAS. Mr. Simon is also an active and engaging speaker.